Over the years, I’ve had the pleasure of enjoying meals and social events at Dio Deka, a wonderful Greek restaurant in the Hotel Los Gatos. The service, food, and ambiance were all top notch when I have eaten there. A nicer setting would be hard to find. 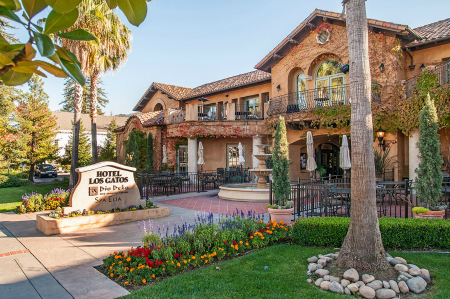 The Hotel Los Gatos is one of the most beautiful buildings in Los Gatos, a town already much loved for its scenic architecture and natural setting close to the coastal foothills. If you haven’t seen it, it’s almost directly across the street from Los Gatos High School so is in the heart of downtown. The architectural style is Spanish, but it reminds me of the elegant and inviting Santa Barbara Spanish style in particular. Inside, the hotel and restaurant are well appointed, comfortable, classy, and relaxing. Great ambiance. At Dio Deka, each employee that I have encountered was warm, pleasant and gracious. Service was never wanting. Their manners and protocol were impeccable. That may sound stuffy, but let me explain by giving an example: in many eateries, even in “fine dining” establishments, patrons are given one knife and one fork. If the utensils are soiled by eating a salad or appetizer before the main course arrives, the used utensils are often given back to the customer if they’re left on the plate as it’s being removed.The idea, of course, is that the patron is expecting too much to get a clean knife and fork for the next dish. Usually the “old” utensils are put back on the table. But not here. At Dio Deka it’s not too much trouble to get it right and provide clean cutlery for each course. It’s a small thing but it’s representative of the quality of the dining experience here. No detail is too small to get right. The food I’ve enjoyed was artistically presented and offered a wonderful mix of greens, olives, celery slices, split cherry tomatoes and dressing together with a small brick of warm goat cheese. It was delicious. The moussaka appealed to both of us, so that is what we each ordered. Set as a stack of circular layers in the middle of a deep dish, this too offered a very pleasing appearance. And again, the flavors were sumptuous. The sauce was too good not to enjoy too; luckily the table had a basket of bread – just right for sopping up the flavors. My only gripe is that when you get a meal with French fries (which aren’t Greek, to my knowledge), they will not serve you catsup. I know, I’ve asked, When they said they didn’t have any, I asked why not, and was told that it’s not Greek. Catsup aside, the food and service is great. At one time, you could go to Dio Deka for lunch, but no more – it’s strictly after 5 or 5:30, depending on the day of the week. If you enjoy Greek or Mediterranean food, do give it a try. Tel 408 354-7700. The restaurant’s website has good info on the menu and background. The hotel’s page for it features the days and hours of operation.